CND Offly Fast - Shellac Moisturizing Remover easily and safely removes CND Shellac, removable gel, liquid, and powder enhancements, tips, wraps, and adhesives from the nails. CND Offly Fast consists of a nourishing blend of macadamia and vitamin E oils to help prevent that brittle feeling that can weaken nails. Saturate the cotton pad of a CND Shellac Remover Wrap with the Shellac Moisturizing Remover. Then, follow the directions on the wrap’s packaging. To get the best results, carefully use an orangewood stick to slide away any remaining product. 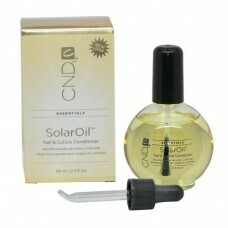 Note: This product was previously called the CND Power Polish Shellac Nourishing Remover. The label and name have changed, but the product is the same.